In the reporting on the Hurricane Harvey aftermath last week, many of us here at the Goldwater were glad to see that natural disasters bring out the best in people. Acts of kindness and helping each other were widespread. We are sure that if Hurricane Irma causes damage in the US, which it probably will, people will be helping one another as much as they can, whilst President Trump will be coordinating rescue efforts. Unfortunately, as we’ve also said many times, natural disasters tend to bring out the worst in people as well. Greed and thieving are a widespread phenomenon when stores are left unguarded and belongings are up for grabs. The Carribean island of St Maarten, which is governed by both France and the Netherlands, is no different unfortunately. Now that Hurrican Irma has passed, reports of widespread looting are reaching us from all places. People entering into supermarkets, food warehouses, liquor depots, furniture stores and electronic equipment stores with supermarket carts taking away as much as they can carry. Shame or remorse is nowhere to be seen. French and Dutch authorities are coordinating their efforts to restore order to the small island at this time. Police reinforcements have been sent. The French Minister of the Interior, Gérard Collomb, has already confirmed scenes of looting. in an interview with FranceInfo he said: "There were indeed a number of looting cases reported last night, and the forces present were trying to restore order. We have already sent in reinforcements, a platoon of gendarmeries (police) that comes from Guadeloupe"
Authorities will have a hard time admitting it, but many of the looters in St Maarten’s capital city headed straight to jewelry stores on Front Street, to the Harley Davidson Store to cart off bikes and the iStore to grab mobile phones. 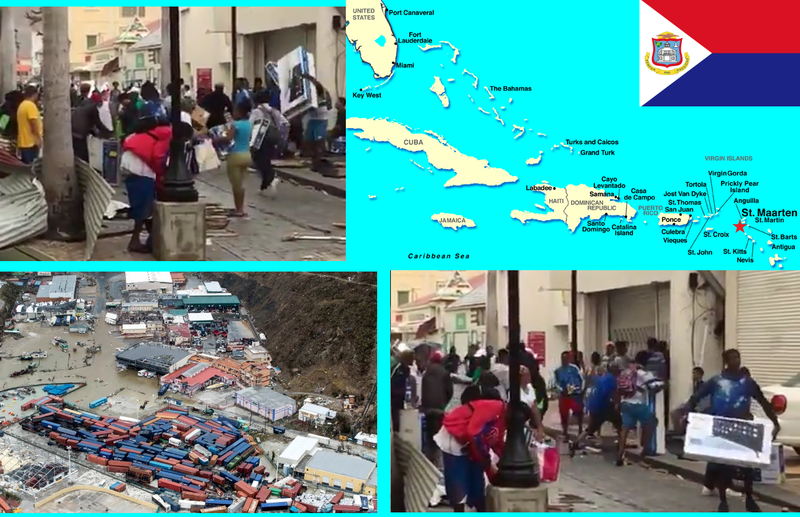 Dutch Marines and local St Maarten law enforcement have setup roadblocks, but they are not enough to stop the looters. Imagine that, NIGGERS being NIGGERS. for being "kept down by whitey"